Please enjoy this guest entry from my good friend Traci Borum. I’ve known her for eight years now…that can’t be possible! She was my creative writing teacher and a great source of encouragement as we both kept receiving rejection after rejection when we were both seeking publishers for our novels. We had a friendly “competition” wherein we sent each other copies of the most biting/most banal rejection letters, and laughed at the amount of rejections a person could receive in a week. Her first novel, Painting the Moon, is getting rave reviews and the second installment is coming soon! When I teach creative writing, I don’t spend much time discussing how to get published. I’d rather spend time teaching the nuts and bolts of technique or story structure, letting the writing itself be the main focus for students. But when I do talk about publication in the classroom, I always ask students a seemingly simple question: Why do you want to get published? Sometimes, they actually don’t. Probably a third of all my students express no desire (at this stage of their lives, at least) to see their work in print. A decision I completely respect. These students tell me their reasons: that they’re shy about sharing their work with the public, or that publishing their work makes it less special somehow, or that selling their work makes them feel like they’re selling out. Some writers simply enjoy the solitude and privacy of sharing their thoughts only with themselves. They want to protect what’s theirs, not let anyone else see it. But for those who do wish to pursue publication, they first should know why. Is it for the money they think they’ll receive? The fame? Is it for validation of their work? Legitimacy? Because the answer to these questions will be the only things keeping you going when you receive rejection after rejection (or absolute silence, which has now become an acceptable form of rejection). Here’s my own answer to that “why publish” question. For years, I’ve pursued publication for various reasons: wanting people’s genuine feedback, hoping readers gain some entertainment/escape from my books (just like I receive when I read fiction), and even something as simple as seeing my words bound in print form (opening up my own softback of Painting the Moon weeks ago was a highlight of my life—I felt like Charlie, opening his Wonka candy bar and finding the Golden Ticket peeking through the wrapper. Very surreal). I admit—it’s a huge rush when a friend or relative or stranger reads my work and tells me about it. Through that experience, we’ve shared something unique. It’s like they’ve taken a peek into a very personal corner of who I am. There’s an invisible connection between a reader and author when a book is read. A connection that’s hard to explain, hard to pinpoint. And to me, that’s what ultimately makes getting published special. And worth all the effort. Like this blog? Subscribe to Tina Bausinger: Mancub’s Mom–please and thank you! Hit the “follow” button at the top! Tina! Thanks so much for letting me guest post. I love your blog! 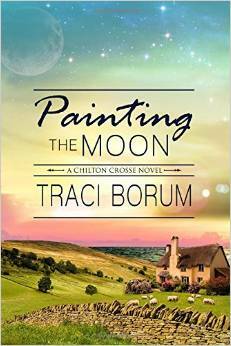 Pingback: Painting the Moon by Traci Borum (Media Blitz) | My Life. One Story at a Time.